Six America’s Cup teams will compete on the America’s Cup race course on the Great Sound in Bermuda next month, with official racing on October 17 and 18, with the event also set to include activities both on land and on-water, with food and drink vendors, exhibitors, a concert and more. Bermudians will have an opportunity to experience the thrill of watching AC45F foiling catamarans racing live next month when the island hosts the third Louis Vuitton America’s Cup World Series event of the season. “This will also be the first opportunity for people around the world to see these high-tech catamarans showcased in Bermuda, the home of the 35th America’s Cup,” the ACEA said. “International broadcast coverage will extend to the US, Europe, China, Australia, Latin America and the Caribbean covering a total of more than 100 territories. “The Louis Vuitton America’s Cup World Series Bermuda will be held from October 16-18 with Emirates Team New Zealand, Land Rover BAR, Oracle Team USA, SoftBank Team Japan, Artemis Racing and Groupama Team France taking in part in the competition that allows them to accumulate points for later stages of the America’s Cup. “Emirates Team New Zealand, led by the youngest helmsman in the fleet, Peter Burling, won the most recent stage of the Louis Vuitton America’s Cup World Series in Gothenburg, Sweden this past weekend to take the overall series lead over Ben Ainslie’s Land Rover BAR and Jimmy Spithill’s Oracle Team USA. Now the series moves to Bermuda. “Along with the racing in the Great Sound, Hamilton’s Front Street will play host to the free “Our Bermuda” Festival and Event Village. “The Festival will feature the very best of Bermuda including food and drink vendors, exhibitors, family friendly activities both on land and on-water from Friday evening through to Sunday evening. Saturday evening will also include a concert at the Fan Zone featuring an exciting line-up of international and local artists. “On Thursday, ahead of the opening of the Event Village, the America’s Cup Community Sailing initiative, the Endeavour Program, is planning to open its new facility in St. Georges, with a full afternoon of activities on the east end of the island. “On Friday, the teams will take part in official practice racing before the point scoring races on Saturday and Sunday afternoon. “All the weekend racing action will be accessible to the public on land, via big screens with live commentary at the Fan Zone. “This is an exciting opportunity for the Bermuda public to get an early look at the America’s Cup and we’re sure the interest level will be high,” said Mike Winfield, CEO, America’s Cup Bermuda [ACBDA]. “This is the first of a planned series of releases that will explain the details of the Louis Vuitton America’s Cup World Series events to the Bermuda public. “We will be releasing more information over the coming days and weeks, particularly with regards to the activities in the Event Village and the process for spectators to access the race course, either with their own boats or via a spectator boat. The races will be held on Saturday and Sunday from 2pm to 3:30pm with a “Dock Out Show” prior to the first race on both days and a “Dock In Show” after the second race on both days. The first race of each day will start and finish in the Great Sound while the second race will start in the Great Sound but finish in Hamilton Harbour in front of the Event Village. “We are thrilled to be racing in home waters for the first time in the Louis Vuitton America’s Cup World Series,” said Jimmy Spithill, skipper and helmsman, Oracle Team USA. The Event Village will be located on Front Street between Court Street and Par-la-Ville Road with the road closing from Friday October 16 at 4pm until Sunday October 18 at 7pm. 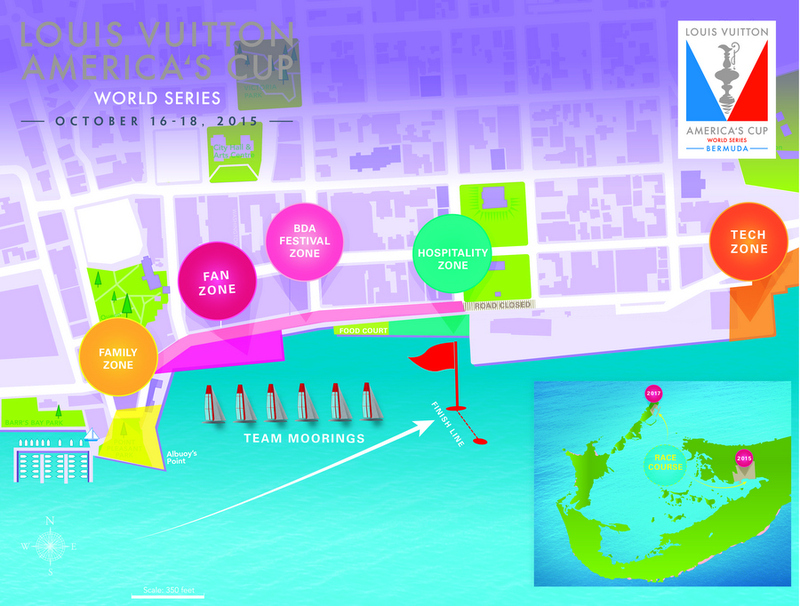 A public Town Hall and panel discussion is scheduled for Thursday, September 17 during which full plans for the Louis Vuitton America’s Cup World Series event in Bermuda will be covered in detail. The panel will include Sir Russell Coutts, CEO of the America’s Cup Event Authority, Dr. Grant Gibbons, Minister of Economic Development and key members of the America’s Cup Bermuda organizing committee. “We are looking forward to having the Bermuda public come out to witness these magnificent boats fly over the clear blue waters of Bermuda,” said Sir Russell. The America’s Cup is the oldest trophy in sport, pre-dating the modern day Olympics by 45 years, and the Louis Vuitton America’s Cup World Series is the first stage of competition in the 35th America’s Cup. Am I suppose to say something else? Yes Aye. Lets get it on. Meanwhile unemployment is on the rise and BTA are spending money like drunken sailors. …and events like this will spur economic activity that will employ people. For how long? This is a short term solution, what happens when it’s all over? They need to fire their graphics person! I think the color profile has been designed for print, not web-viewing. And the sponsor needs to reopen the Louis Vuitton Front Street PRONTO! I was just wondering when they were going to start advertising this. Get everybody involved and excited. The advertising been POOR actually. Fingers Crossed the weather and the Unions cooperate. The BTA should have had this all over regional sailing publications in places like Newport, RI. Annapolis, MD. & Charleston, SC. long ago. It will also be a good test of how the traffic is managed when front st closes. If it goes well, will people consider closing it permanently? Just because you don’t read the paper, watch TV or go online or are too stupid to pay attention doesn;t mean advertisng was POOR !!! This leaves out the important details of the teams setting up their bases on the commercial docks, limiting the arrival of goods to the Island for 2 weeks. It can be difficult for retailers to get goods to the Island in a timely manner during slow season let alone weeks before Christmas.